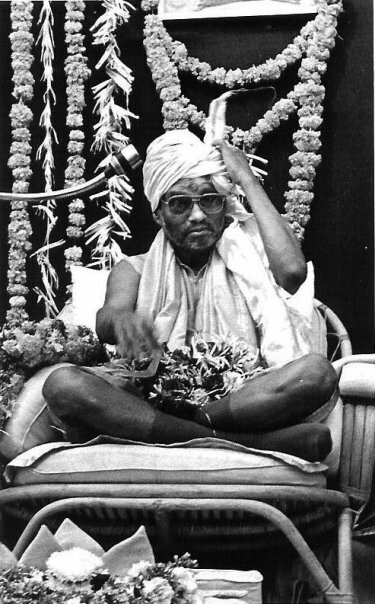 I once skipped bowing to my Guru on Guru Purnima. It is the biggest holiday (holy-day) in the yoga tradition, not only because it is the full moon dedicated to honoring the Guru but also because Grace flows most fully on Guru Purnima. I was living and serving in the Ashram, and several thousand people came to see Baba, understandably! I worked in food service, helping to feed them, so I and my fellow sevites were very busy. I bowed to Baba in my heart, skipped taking a break, and went on serving. I went forward in the darshan (reception) line to greet Him the next night. He tapped me with the peacock feathers. I lowered my head below my heart in the classical pranam (bow). I looked up at Him as I came up and He looked at me in His usual way. It was all perfect and it was all incomplete. I knew that I had blown it. I had missed my chance. His Grace was there, certainly — but the night before would have been something else. If only I had prioritized my relationship with Him instead of the work I did for Him. Tricky! I thought of the New Testament story of Mary and Margaret. I began to understand what it was like to be the one bathing His feet instead of the one bustling around getting things done. I’d always been the “bustler.” I have bustle karma, that’s for sure. It’s true that things must be done. There’s a lot to do in order to support those who come to the Guru, in person or through the teachings, in books, online, etc. But what does the Guru need? Nothing. That’s the point. The Guru is the only not-needy person you’ll probably ever meet. That’s the reason to be in this relationship. This relationship, like any relationship, needs some TLC. When you do your part, you get more out of what was always available. It’s like being in relationship with the sun: when you go out to soak up some rays, you get the vitamin D. When you don’t, you don’t. But the sun is always there. It’s always shining. It’s always giving. In India, Guru Purnima is the day when people pilgrimage to see their Guru. This is no small feat! The full moon in July is the middle of the monsoon, which makes travel precarious at best. They bring gifts and donations, usually providing enough financial support to cover the Guru’s and His or Her Ashram’s needs until the next Guru Purnima. Thus the Guru doesn’t have to go out with a begging bowl every day, nor charge for the teachings. The tradition of providing the teachings for free comes from a land where they know that they must support the one who gives the teachings. Buddha gave His first teachings on Guru Purnima. Veda Vyasa was born on Guru Purnima. Thus Buddhists, Hindus and yogis all celebrate this holy day every year. Personally, I used to take this time to go to India to be with my Guru, visiting His samadhi shrine, a meditation room in which His body is interred under a marble slab. Since I’ve been appointed to serve in this way, I stay in America for the celebration, so that I can be available to everyone who wants to come. In India, it’s hard to see the full moon on that July night due to the monsoon clouds. My experience has been that, somewhere in the night, just when I’m looking up, the clouds will part just a little so I can see the moon. It is the biggest full moon of the whole year, which is why the sages dedicated it to the Guru. It is the biggest because it is the point at which the moon is closest to the earth. So if you cannot join me for Guru Purnima, go out and soak up some moon rays. And chant “Guru Om.” At least for the evening. And meditate. What’s the Guru for anyway? To help you turn inward. To help you know your own Self. That’s the point. This entry was posted in Celebrations, Grace, Guru, India, Swami Nirmalananda and tagged Ashram, Grace, Guru Purnima, India, Pranam, Swami Nirmalananda, Vyasa on July 18, 2013 by Svaroopa Vidya Ashram.